Under certain conditions, commercial drivers in California can have traffic tickets dismissed by attending traffic school that’s approved by the state. If you’re a commercial driver and your ticket qualifies for the option, enrolling in traffic school is an affordable and simple way to prevent Negligent Operator Treatment System (NOTS) points from being added to your license. Taking a class will only be helpful, though, if the court is notified that you’ve successfully completed the class. If you’ve finished traffic school to have a California ticket dismissed, here’s how to make sure that your completion of the course has been reported and that your ticket has been dismissed. What are the requirements for getting my CA traffic ticket dismissed? First and foremost, you’ll need to make sure you meet all of the requirements to have your ticket dismissed. Typically, the court will send you a courtesy notice if your ticket qualifies under AB 1888. Once you receive this notice, you need to let the court know before or at your scheduled hearing that you plan on enrolling in traffic school. You’ll then have to enroll in and complete a California-approved traffic school by the assigned deadline. If you’re unsure of whether a particular traffic school is approved, you can check with the court. All California traffic courts have lists of approved schools ready to give to anyone who asks. Should you miss any deadlines or fail to go to a state-approved traffic school, you won’t qualify for the ticket dismissal program — even if the school notifies the court that you’ve completed its class. What are the benefits of enrolling in traffic school online? Second, it’s important to understand how enrolling in traffic school will benefit you. Even after completing traffic school, your ticket will still show up on your driving record, and you’ll still have to pay any fines or fees that are assessed. The reason to attend traffic school is to prevent NOTS points from being added to your license. Once you complete the classwork, any points associated with your ticket won’t be put on your license. Does my online traffic school alert the court to dismiss my traffic ticket? When signing up for traffic school, you should let the school know that you want your coursework completed once you’re done. As long as they know to, most traffic schools will automatically notify the appropriate court that you’ve finished the coursework once you do. You should confirm with both your traffic school and the court that this notification was sent, though. To confirm that the traffic school sent the notification, simply contact them and ask for written verification that the court has been notified. It’s easy for a traffic school to look up your information and make sure a notification was sent to the proper court. It’s important to ask for written verification, and not just verbal confirmation over the phone, so that you have a record if there’s a mix-up with the court. The easiest way to check with the court is to look up your case on its website. Many of California’s traffic courts have online case lookup features, which often let drivers pay fees, request to go to traffic school and check the status of their case. 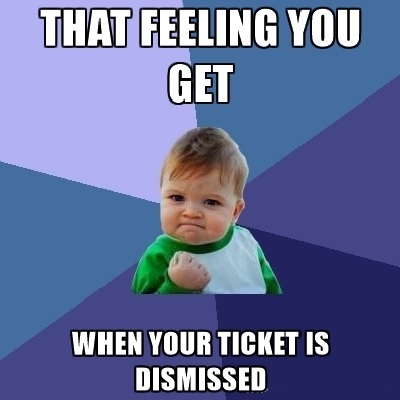 If your court does, you might be able to confirm that your ticket was dismissed without calling or going to the court. If the court doesn’t have an online case lookup feature, you’ll need to either call someone at the court or go in person. To save time, check the traffic department’s phone number or window hours online before your call or go. After finishing traffic school, your California traffic ticket should be dismissed. Don’t, however, leave the paperwork to chance. Confirm that the court was notified of your traffic school completion and that your case was dismissed so there aren’t any issues with your employer or insurer.